For a tribute band, The Smiths Indeed are as dedicated as you’ll get and once again showed their popularity in Liverpool on Saturday night. A crowd of over 300 twenty to forty something’s crammed into the city’s intimate Carling Academy 2 venue to sing their hearts out to songs penned by a Manchester creation, which firmly closed the divide between both creative cities into one equal voice. Following the recent release of the double CD compilation, The Sound of The Smiths, three weeks ago, devotees of The Smiths went ballistic at hearing a live performance of 21 songs featured on the 45-track album, all to a backdrop visual of the Salford Lads Club, a place etched in Smiths history. The Smiths Indeed covered only music written by the band during its beginnings in 1982 to separation in 1987, but intensify the performance through Belgium-born front man Jürgen Wendelen’s portrayal of the enigma Morrissey. 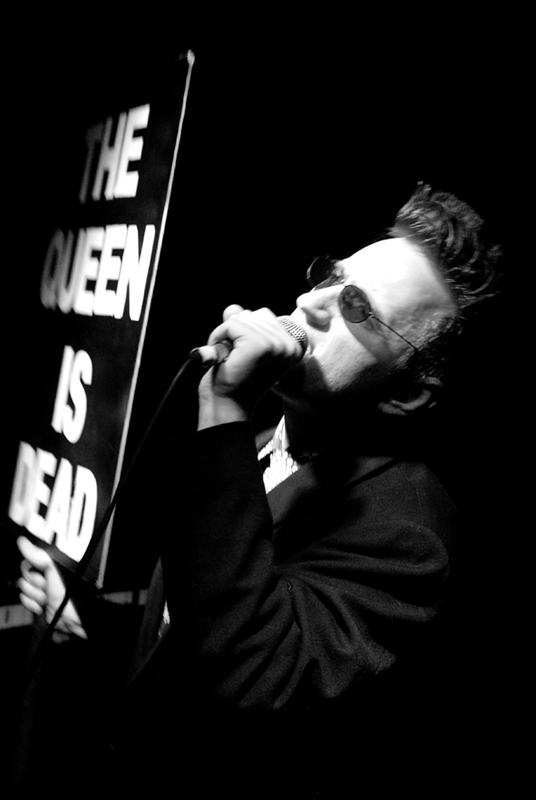 Wendelen captures Morrissey’s baritone and falsetto vocal in renditions of signature songs such as Heaven Knows I’m Miserable Now and Stop Me If You Think You’ve Heard This One Before, but also the stage mannerisms and look – including thick rimmed spectacles and spiky flat-top hair cut so accustomed to the singer – helps build a further connection with the fans. Wendelen’s enthusiasm to the cause is confirmed even further through his use of an original tambourine used by his idol in 1992, to stories of him even hitching across the country and managing to get into a sold out Royal Albert Hall concert in London, without a ticket. Not even a drive-by attack two years ago – where he was hit by a heavy object whilst cycling through Liverpool city centre, causing him to suffer head injuries and lose a tooth – could dampen his spirits as he made a quick recovery to perform a week after the incident. Simon McKelvie takes up the task of recreating the Marr guitar sound and overall does a good job – backed with Bobby Kewley on bass and Paul Tsanos on drums as Rourke and Joyce respectively. As flowers shower the excited audience – a trademark of The Smiths spectacle – Wendelen and his tribute act head into the encore with arguably the best three cover songs of the set. The Queen Is Dead, Shoplifters of the World Unite, and There Is a Light That Never Goes Out end what proved to show how important The Smiths have been to so many people. The Smiths Indeed next head on an Unhappy Birthday UK Tour starting in February, celebrating Morrissey turning fifty on 22 May 2009.